The greatest origami asters face off for the title, using their magic to make origami creations really come to life! Can your knowledge of the art of folding paper impress the judges and earn you the title of "Best Origami Artist"? 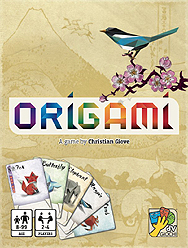 ORIGAMI is a fast, fun card game for everyone! You won't need to fold any paper, except for one: You can make your very own first player origami sculpture!